To get stunning driveway results from your pattern imprinted concrete installation it’s important to select a colour blend that either contrasts with your house or easily blends in. There are a range of imprinted concrete patterns available, from cobble styles which look great on a smaller and longer driveway; to large slate designs that look fantastic on wider paving surfaces. Careful attention needs to be paid to drainage, especially if surface water will run towards your house. The installation of drainage channels and a soakaway may also be necessary. Suitably qualified and experienced installation teams should ensure a professional job is completed and any payments will normally be required at each stage of installation. Taking care of an imprinted concrete driveway is easy. Regular cleaning and re-sealing is best. There should be no weed growth which is a major low maintenance attraction. 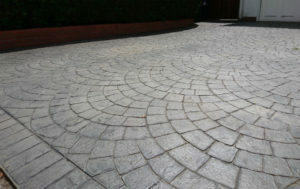 Prices range from £50 per square metre up to £150 per square metre. Any price below £50 should sound alarm bells unless it’s a simple overlay with no drainage. Be wary of ‘sales‘ type companies with glossy pictures and stories. If possible contact an installer direct.